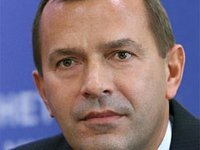 Ukrainian President Viktor Yanukovych has signed a decree appointing Andriy Kliuyev head of the Presidential Administration. The head of state signed the decree on Friday, reads a statement posted on the president's Web site. Under another decree, Yanukovych dismissed Kliuyev as National Security and Defense Council secretary.